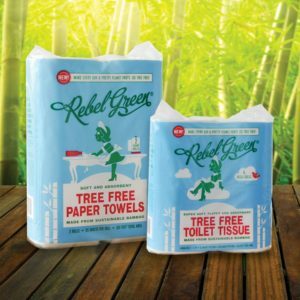 Bamboo Toilet Paper & Paper Towels You’ll Mistake for Conventional - Rebel Green: Eco-Friendly Products Responsibly Made in the U.S.A.
Did you know that nearly 9 million trees are cut down each year just to make toilet paper? That’s more than 24,000 trees per day. Amid the global movement toward eco-friendly solutions, Rebel Green offers alternatives in Tree Free Toilet Tissue and Tree Free Paper Towel. Made from sustainable bamboo, they allow consumers to make better choices for the environment without sacrificing the softness and durability of conventional paper products. Soft & Absorbent. Rebel Green Tree Free products are just as soft and durable as conventional paper products. In fact, bamboo is widely used in the production of really soft textiles like sheets, towels and T-shirts. Made from Bamboo. Trees remove carbon dioxide from our air and replenish the oxygen we need to breathe. Some trees can actually take 30 years to grow and mature, while bamboo can grow 2.5 feet per day. In just 3-4 months, bamboo is fully matured and ready to be harvested again. Panda Friendly. Pandas are adorable, and they eat bamboo! But don’t fret. There are at least 1,500 species of bamboo, and the bamboo grass used in Rebel Green Tree Free products has been certified as a species that is not a food source for pandas. Carbon Neutral. The simple act of cooking over an open fire inside the home kills nearly 4.2 million people each year due to smoke inhalation. By partnering with The Paradigm Project, Rebel Green helps to fund clean cook stoves for women and their families in the developing world. These stoves reduce air pollution and make the cooking process safer for families and the environment. This reduction in carbon emissions completely offsets the carbon footprint of producing Rebel Green Tree Free products. Home Delivery. Rebel Green’s Tree Free products are available for purchase on Amazon, Lucky Vitamin, and in the Rebel Green Shop, so you can restock without ever leaving home. For more information on Rebel Green’s Tree Free products, click here. Rebel Green is a line of natural cleaning products that is dedicated to providing customers a safer choice both inside the home and in the environment. Motivated by the knowledge that the products we choose to clean our homes has a ripple effect on the world, Rebel Green is committed to creating a product line that sustainable, natural and crafted with concern for the planet on the frontline. Founded by Ali Florsheim and Melina Marcus in 2008, Rebel Green is a certified Woman Owned Small Business headquartered in Milwaukee, WI.